Swansea Pride – 6 Weeks to go! The 6 Week Count down is here… until Swansea Pride in all its glittering rainbow glory arrives in Swansea… an all-inclusive Pride for ALL. Unite, show support, demonstrate respect to the LGBT+ Communities and most of all celebrate Equality, Diversity and Individuality through love this May. The aim of this year’s Swansea Pride celebration is to raise awareness and give support to our LGBT+ Communities, with organisations, groups, companies, businesses, families and individuals all being invited to get behind and get involved in this multicoloured community driven celebration. ANY ONE can get involved in this year’s celebrations. And what is on for Pride Week and who is involved? One of my aims for this year’s Pride is to educate and involve younger audiences and teens to Pride, To teach and allow young individuals to celebrate themselves and give confidence to accepting each other’s identities. The Mark Jermin Stage School’s Elite Musical Theatre students will perform a youth Musical Theatre inspired showcase based on Pride to kick start the week on Tuesday 30th April at Swansea’s Cabaret bar HSYT from 7pm.“Pride Cabaret at Hyst” also welcomes Musical Theatre professionals and Conservatoire Graduates along with some of Swansea’s most aspirational performers to Swansea’s very own hub for up and coming musicians and performers; The Hyst, a beautifully intimate venue. A cabaret presented with confidence, care and of course, a huge amount of PRIDE. We will take you on a journey through the evening, exploring musical theatre like you’ve never seen it before. In this evening we invite you to embrace the true YOU and join our performers in baring their hearts on their sleeves as they take on some unconventional roles to present a cabaret evening like no other. 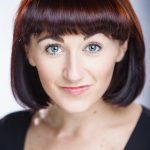 In this no boundaries cabaret, the singers will break the moulds of musical theatre and perform their favourite show tunes regardless of their gender as they celebrate gender fluidity within the musical theatre community. 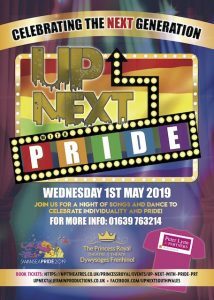 Wednesday 1st will see a spectacular youth variety show UP NEXT WITH PRIDE at the Princess Royal Theatre Port Talbot.Up Next with Pride features a cast of choirs, dance schools, gymnasts, singers whom will storm onto stage with an explosion of courage, confidence and of course Talent! Each performer will step out to celebrate their uniqueness, nerve and passion as they showcase their skills and celebrate individuality in this elite showcase which promises to make South Wales PROUD! An up-beat, heart-warming celebration, just bursting with rainbow colours! Support for this Production is being given by Peter Lynn and Partners. 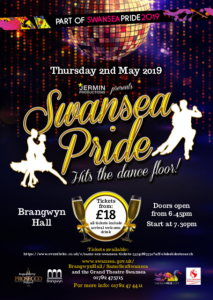 2 brand new Events arrive in Swansea for Pride: “Swansea Pride Hits the Dance floor” will feature novice same gender couples partner each other on the dance floor of the Brangwyn Hall for a PRIDE inspired Strictly Come Dancing evening that promises to be utterly FAB – U – LOUS!!! The dance event running as part of a Swansea Pride Week will feature real gay and lesbian couples from the South Wales area all competing to win the Swansea Pride Hits the Dance Floor Glitter Ball Trophy which is kindly being donated byDawsons Property. Each pair will be introduced to local dance teachers and instructors and undergo a gruelling 10 weeks of training to get those fingers flexing and toes pointing. Amongst those aiming to achieve a perfect ten will be some of Swansea’s well-known, elite representing a variety of working backgrounds. Contestant such as KEV JOHNS partners with breakfast radio pal LEIGH JONES will be hitting the dance floor and are now well into their rehearsal process with their choreographer and dance expert Jalisa Andrews. Other parings include GEMMA PEGLER from Fitness brand Funky Pump and girlfriend DEBBIE JONES who are getting taught by Natalie Salter from the Natalie Salter Dance Company and Swansea’s own drag stars RUBY SLIPPERS and LADY EMERALD who are 2 drag queens dancing together at this fantastic event with the help of Rachel Smith from the Rachel Smith School of Dance! MICHAEL EVANS and LUKE JONES choreographed by Ebony Roberts. This Event promises to be a spectacular night out for all to enjoy, All guests will also receive a beautiful goody bag courtesy of the fab-u lous DWJ Wealth! Another FIRST for Swansea will see Ru Paul’s Drag Race star FARRAH MOAN recently scene on screens on the latest Ru Pauls’s Drag Race All Stars Season 4, will host a pre Pride Launch party on Friday 3rd May at Swansea Venue Fiction and Vinyl with her hilarious show.For years the art of drag has been confined and ignored until the hit television series RuPaul’s Drag Race stole our hearts and showed us all what we had been missing. 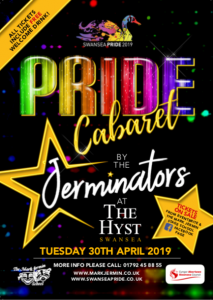 Today, drag culture has been dusted off, pushed out of the closet and straight to centre stage and now it seems that Swansea wants a piece of that glittery, ‘painted’ pie. Miss Moan will be making a small part of ‘herstory’ for the city as she marks the first RuPaul queen to visit the cobbles of Wind St. Swansea Pride’s modernised refurbishment, however, is highlighted with Farrah Moan and the long anticipated introduction of more drag culture within the festival and the city itself. And all these plans and individual events are all driving towards the Main Pride Day in the heart of Swansea. For the Main Pride Day, the Swansea Pride Committee are hoping that this week’s celebration will be a real highlight in the Swansea calendar. We have support from 2 fantastic Sponsors in the form of Unison Swansea (Council branch)and Swansea BID (Business Improvement District. 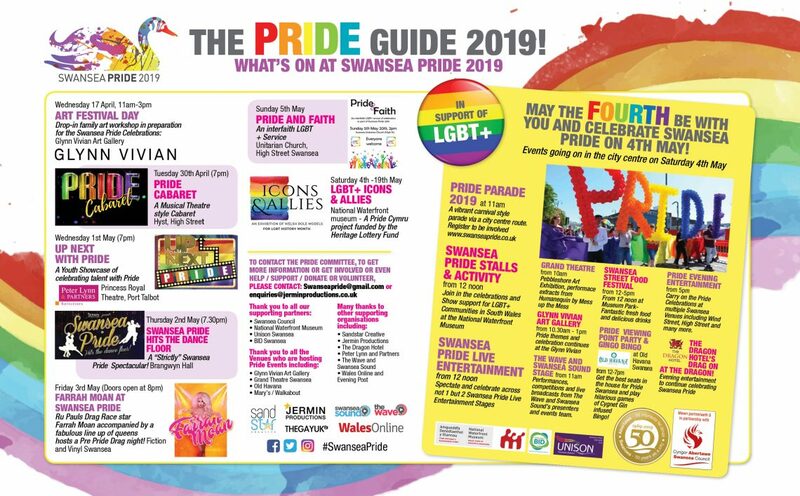 )Pride Swansea will also form part of the 50thBirthday celebrations of our beautiful Swansea being a city, and the City and County of Swanseaare doing a stellar job in supporting the Event and helping ensure the Main Pride Day and Event goes brilliantly! What is going on for PRIDE on Saturday 4thMay? A vibrant and colourful Carnival style parade will hit the streets of Swansea! LGBT+ Groups and supporters will showcase their take on Pride. Local organisations and businesses who are also keen to show their support may take carnival style floats and dress up vehicles. Marching Bands and party style bands are also planned to join in the fun which will be an exciting and family friendly spectacle to watch. The aim to bring a brilliant Parade to the city centre that is a culinary for the senses and hugely exciting and fun to watch or partake in- a Parade for all! The Pride celebrations will continue, Thanks to the wonderful support from the National Waterfront Museum. The Museum site will host stalls and activity suitable for guests of all ages to enjoy. Decorations are being donated by the wonderful Mr Flagwho has been an incredible support network in the past 2 years of Pride Swansea. There will be activity scheduled throughout the day throughout the area (inside the Waterfront building and amongst the Green.) This will include live music from Singers, and Groups, Guest speakers, Celebrities, Performance acts, Bands, Tribute Acts, LGBT+ pop up entertainment, Drag Queens, The Wow Dolls, The Crowning of a Pride King and Queen, and face painting amongst the existing Swansea Street Food and Drink festival to create a wonderful atmosphere continuing the ethos of Pride. The ever supporting teams and staff from Swansea Sound and The Wave will also be present at the celebration, and will be offering fun, performances, audience participation and competitions as they broadcast live from the Pride site,. The Glynn Vivian Art Gallerywill host Pride Activity and have been so kind in allowing the Committee to host opening meetings in the space, The Grand Theatre are also showing brilliant supportThanks to the Ian McKellen fund in allowing Performance Space for Mess Up the Messto showcase some of their work including extracts from Humanequin, a trans gender play and the Pride Cymru Icons and Allies exhibitionarrives at the National Waterfront Museum from 4thMay. 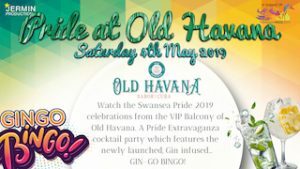 For those wanting to bask in their Pride Glory with maybe a cocktail or signature Cygnet Gin in hand, can do so from the Best seats in the house at Old Havana who are hosting a VIP Pride Partyalong with games of the hilarious GIN-Go Bingo! There will also be an ongoing presence of Pride within the City Centre with businesses and supporting shops, The Quadrant, and cafes and organisations joining the PRIDE Celebrations by decorating their windows and displays and putting on their own Pride days. Some discounts may be offered for all Pride guests. And the celebrations continue well into the Bank Holiday weekend….An interfaith service in Pride, Love and Faith is being offered by the Unitarian Church on Sunday 5thMay at 2pmand this is open to all guests and faiths. We hope you all love this year’s Swansea Pride Artwork too? The poster was designed by Samuel Knight from SnoozyLion and the mammoth job of putting together the Pride Guide was designed by Sandra Evans of Sandstar Creative. We are super grateful for all the kindness and interest shown already in this year’s Pride by organisations including GMB Swansea, What’s On Swansea,The Gay UK, Wales Online, Swansea’s Evening Post and the Dragon Hotel who will be accommodating our Pride guests, and Celebrities! Swansea Pride is a non-profit organisation made up of passionate and determined volunteers who envisage a Swansea Pride for all… for all community groups to join together in love and unity, to celebrate individuality, show respect and kindness to others and celebrate in the openness of our wonderful city of Swansea.